putting up a fight these days. The NHL playoffs won't have a monopoly on Canadian sports headlines this week, thanks to the UFC's long-awaited debut in Toronto with a Saturday night card that's expected to draw a record crowd of 55,000. Many hockey fans have been looking forward to the event for months. But for others, this week's hype will serve as an introduction to the entertaining but often confusing world of mixed martial arts and the UFC. So in an effort to make the event as accessible as possible to Canadian sports fans, here's a hockey fan's guide to how the UFC stacks up with the NHL. UFC: There is a common misconception that the sport is a vicious free-for-all where anything goes no matter how brutal, when in fact it is governed by a clear set of strictly enforced rules. NHL: There is a common misconception that the sport is governed by a clear set of strictly enforced rules. UFC: A fighter signals that he has lost his will to win and no longer wishes to compete by "tapping out". NHL: A player signals that he has lost his will to win and no longer wishes to compete by signing a contract extension with the Ottawa Senators. UFC: "The World's Most Dangerous Man" was the nickname of UFC Hall of Famer Ken Shamrock. 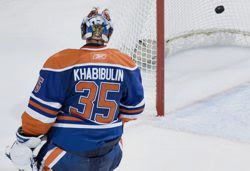 NHL: "The World's Most Dangerous Man" is what Flyer fans call whoever is starting in net for that night's playoff game. UFC: The action takes place inside a caged structure called an octagon, which many critics have called the most dangerous structure in all of sports. NHL: The action takes place inside a rink which has been carefully designed to ensure the safety of all oh good god look out for that stanchion! UFC: "Ground and pound" is a fighting style that aims to take an opponent to the mat and then employ a striking attack from a dominant position. NHL: "Ground and pound" is Bruce Boudreau's answer to the question "What is your favourite type of beef, and how much of it have you smuggled into the arena tonight in your pockets?" UFC: If a match does not end in regulation time, it goes to the judges' decision; in especially even and hard-fought contests, the contest can be declared a draw. NHL: The league knows that real sports fans don't enjoy ties, and would be much happier if the UFC moved to deciding matches with a rock-paper-scissors contest. UFC: If a girl in a bikini holds up the number one to the crowd, it signifies that the first round of a fight is about to begin. NHL: If a guy in a Bruins jersey holds up the number one to the crowd, it signifies that his glove got stuck. Why, what did you think it meant? UFC: Competitors know that it's time to start throwing punches when they hear those four words: "Let's get it on!" NHL: Competitors know that it's time to start throwing punches when they hear those four words: "Hello, I'm Matt Cooke." UFC: Fans are encouraged to watch "The Ultimate Fighter", a made-for-TV production that is occasionally entertaining despite the results holding little actual importance. NHL: Same concept, but they call it "the regular season". UFC: Canadian star Georges St-Pierre employs a methodical style that is highly effective but is often criticized for not producing exciting or dramatic moments. 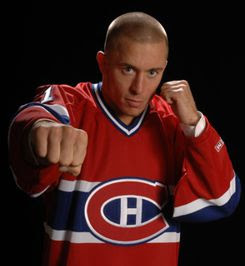 NHL: Georges St-Pierre has been offered the head coaching job in New Jersey. UFC: Popular commentator Joe Rogan is also one of his country's best-known standup comedians. NHL: Popular commentator Don Cherry is also one of his country's best-known standup comedians, although he doesn't seem to realize it. UFC: A hyper-extended elbow and broken arm can be the result of a competitor not tapping out quickly after the successful application of an armbar. NHL: A hyper-extended elbow and broken arm is an acceptable reason to miss one or two shifts during the playoffs while the trainer tapes it up. UFC: A "choke" is a legal manoeuvre in which a competitor cuts off his opponent's air supply in order to secure a quick submission. 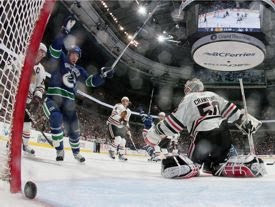 NHL: Insert your own Vancouver Canuck joke here. UFC: Occasionally schedules events in Toronto in late-April. NHL: Not that anyone can remember. NHL fans learned something new this week when Colin Campbell revealed the existence of a "hitting zone" behind the net where, apparently, headshots are legal. for Todd Bertuzzi out of your mouth. The NHL made some unexpected headlines over the weekend, thanks to a bizarre story out of Detroit. After years of fans celebrating postseason Red Wing goals by tossing an octopus onto the ice, the league has apparently pushed for a crackdown that will see fans fined and ejected for participating in the tradition. The news was met with instant and near-unanimous scorn by hockey fans, as the move apparently makes the NHL one of the few businesses in the world that discourages customers from hurling animal carcasses at its employees. But fans that are angry about the Detroit development should get ready for more outrage, because the octopus ban is just the beginning. Sources tell me that the NHL is preparing a detailed code of conduct for hockey fans that will be rolled out over the coming months. If the majority of fans decide to make more noise for the mascot's hot dog gun than they do for the action on the ice, he's allowed to switch to live ammunition. Fans in the upper deck may not throw objects or shout insults at Zdeno Chara. In return, Chara may not reach into the stands, pluck the fan out of their seat by the back of their shirt, and dangle them menacingly over his gaping mouth. Fans are advised to refrain from taunting the opposing goaltender by derisively chanting his name until he has actually allowed a goal. If you try to start the chant on the opening shift, the league-appointed statistician in attendance should just go ahead and award credit for the shutout that's inevitably coming. Any Vancouver Canuck fans throwing items towards the ice who accidentally drills those two dancing guys in the green bodysuits instead shall receive a stern warning and a high-five. All fans are strongly encouraged to try to start "The Wave" during games, assuming they have first invented a time machine and travelled back to 1987. Toronto Maple Leaf fans with tickets in the lower-bowl section must not suddenly cheer or leap to their feet during the first ten minutes of a period, as it may startle the waiter carrying the miso-glazed sablefish and truffled Yukon potato gnocchi to their table in the Platinum Lounge. Every lifelong diehard Florida Panther fan should really think about trimming his nose hair, Dave. Montreal fans should feel free to keep setting cars on fire after playoff games, since otherwise lazy hockey bloggers would have to come up with new material for their Habs jokes. Feel free to roll your eyes when they blare "Welcome To The Jungle" into the arena for the fifth time this period, as it will help your fellow fans identify you as somebody who lacks awesome taste in music. Ottawa Senator fans must not throw any object in the direction of the arena's video scoreboard, since it was officially designated as a protected heritage item back in 1952. We're not singling out anyone in particular and this is purely a hypothetical, but maybe certain fan bases should think about hitting a treadmill before leaning over the glass by the penalty box to taunt the other team's enforcer. Fans should refrain from yelling "SHOOT" at Tomas Kaberle when he has the puck at the point. This isn't really a formal rule, but man, just don't waste your time. Phoenix Coyote fans will not be allowed to throw things on the ice, or yell things, or attend hockey games, ever again, starting later this week. goaltenders, and also the Chicago guys. The Western Conference playoffs are upon us, featuring an opening round packed with fascinating questions. Can the Canucks live up to expectations? Is this the year that the Sharks get the playoff monkey off their backs? Will the Red Wings make one more championship run? Shouldn't this preview have come out before all of the series had already started? Read on for the answers to at least some of those questions. The matchup: Finally, "Mighty Ducks vs. Predators" is an NHL playoff series and not just the title of my unfinished screenplay for the greatest movie franchise crossover of all time. The view from Nashville: Leading scorer Sergei Kostitsyn is further proof that maybe the Montreal Canadiens should just stop trading away Belarusians. Player to watch: Ryan Getzlaf, who continues to be cruelly mocked by linemates Corey Perry and Bobby Ryan for being born with only one first name. Prediction: You picked the Ducks in this series, then changed it to the Predators after realizing your bracket needed at least one upset. The matchup: In a move borrowed from pro wrestling, the Coyotes have apparently secured a rematch with their rival by agreeing to a loser-leaves-town stipulation. The view from Detroit: The franchise no doubt feels a strong urgency to win now, as most of its star players are only under contract for another decade or two. The view from Phoenix: The fans will be asked to institute a "white out", in a helpful effort to prepare the players for what they'll be seeing every time they open their front door from October through April next season. Player to watch: Henrik Zetterberg recently told reporters that he could miss several games, they think, although it was hard to hear him since his playoff beard had covered his entire upper body after the a few minutes. Prediction: The dominant story will be the possibility of the Coyotes moving on to that one location they're always linked with but never seem to go: The second round of the playoffs. The matchup: This all-California matchup will be perhaps the most exciting first round series that you watch highlights of on YouTube after falling asleep during the first period of every game. The view from San Jose: Players report that Antti Niemi keeps talking about some mythical trophy you can win at the end of the playoffs; man, are those Finnish guys crazy or what? The view from Los Angeles: Anze Kopitar will be sidelined for the rest of season with torn ligaments and a fractured ankle, which makes his matchup with Joe Thornton basically even. Player to watch: The Kings decided not to have Brayden Schenn make his playoff debut to start the series, as they don't want all of Wayne Gretzky's franchise scoring records broken until round two. 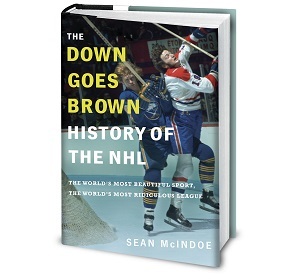 Prediction: This will be the most important and newsworthy series of the first round, according to every hockey writer explaining to his editor why he needs to be the one sent to cover it. 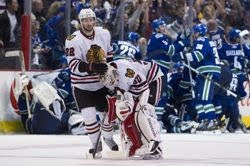 The matchup: This grudge match is the first round matchup that Vancouver fans were hoping for, according to that sobbing guy in the Canucks jersey curled up on the floor in the fetal position. The view from Vancouver: Alain Vigneault recently scoffed at media reports that he's not a good playoff coach, before returning to practice to run the team's shootout drills. The view from Chicago: If they need inspiration, all they have to do is look at last year's Stanley Cup team photo, and realize that… hey wait, why is Ryan Kesler lurking in the background? Player to watch: Roberto Luongo, who must prove he can be a big-game goaltender after not leading a team to a major hockey championship in almost 14 months. Prediction: The Blackhawks put up a good fight but lose the series, then have to explain to a confused Marian Hossa what an "offseason" is. Gomez, three hours later, alone in his apartment. The playoffs are here, which means it's time to offer up painstakingly detailed predictions for each first round series that will be proven disastrously wrong midway through the opening period of game one. Here's an in-depth look at the Eastern Conference matchups. We'll take a look at the Western Conference later this week. The matchup: This is a dream matchup for hockey fans who love the NHL draft but only have time to watch the first few picks every year. The view from Pittsburgh: Head coach Dan Bylsma has worked hard to keep players focused despite an unprecedented battle with injuries, which is great right up until he inevitably gets injured. The view from Tampa Bay: Martin St. Louis finished with 99 points, making the century mark just the latest thing that he can't quite reach. Player to watch: Sidney Crosby sitting in the press box doing nothing, according to whoever's directing the TV broadcasts. Prediction: Fans will be dazzled by the stunning displays of skill on the ice, right up until league officials explain to Mario Lemieux and Steve Yzerman that it's time to stop screwing around and let the two teams start the game. The matchup: Montreal coach Jacques Martin might have trouble with the Bruins, since he historically struggles in the playoffs when faced with good teams built by the Toronto Maple Leafs. 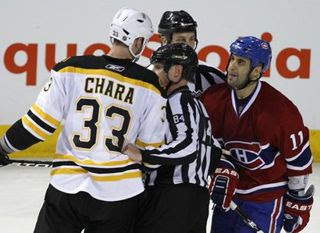 The view from Montreal: The Canadiens would love to get some payback against Zdeno Chara if they weren't being held back by arbitrary rules, like the instigator penalty and also the basic laws of physics. The view from Boston: Tim Thomas set a league record for save percentage this season, although that number drops significantly if you factor in the ability to save his own dignity in fights against Carey Price. Player to watch: Dr. Mark Recchi, who has kindly agreed to signal from the bench to let us know whether players being scraped off the ice onto a stretcher are actually injured or not. Prediction: The Canadiens lose the series, but finally get their revenge on Chara at the end of game four when they all squeeze his hand really hard during the post-game handshakes. The matchup: It's the franchise that's always trying to win without a superstar goalie vs. the franchise that's always trying to win with nothing but a superstar goalie. The view from Philadelphia: The Flyers finished the season on an extended cold streak, almost as if they somehow got this weird idea that being a high playoff seed isn't all that important. The view from Buffalo: In the post-lockout era, the Sabres have an excellent record in playoff series that involve Daniel Briere. Player to watch: Former Blackhawk Kris Versteeg continues to annoy his Flyer teammates who ask him for advice on winning the Cup by answering "Well, the most important thing is to face a bunch of overrated losers in the finals". Prediction: Buffalo's sports history + the likely return of Chris Pronger = something terrible is going to happen to somebody. The matchup: Experts warn that the coaching matchup between John Tortorella and Bruce Boudreau could lead to a severe worldwide shortage of f-bombs. The view from New York: The Rangers were on the verge of missing the playoffs before clinching a spot when Carolina was eliminated on a dramatic last-minute goal from NBC's senior vice president of sports programming. The view from Washington: Alexander Ovechkin managed a career low 32 goals on the season, although in fairness he did spend every game laying in a hammock at centre ice while napping with a sign around his neck reading "Wake me for the playoffs". Player to watch: There will be a ton of pressure on Washington's talented but unproven young goaltender, whoever that happens to be on a given night. Prediction: Just like last year, the top-seeded Capitals should be set to dominate just as long as they don't run into an elite European goaltender who can single-handedly…. oh. Oh man. 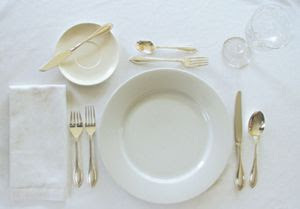 Alfredsson's place setting had no cup. The NHL's regular season can sometimes feel like it drags on forever, and fans can be forgiven for getting excited when the playoffs finally arrive. Every hockey fan, and especially those that root for a contender, has been waiting for months for the real hockey to start. But that excitement is no excuse for losing sight of the rules of basic etiquette. After all, when the games matter the most even a simple faux pas can unintentionally ruin the moment for one your fellow fans. DO: Be respectful of your fellow hockey fans' desire to remain focused on the playoffs, free of needless distractions. DO NOT: Interrupt this focus by scheduling unnecessary and annoying events during this time, such as birthday parties, weddings, or federal elections. DO: Assure the dejected Toronto fan at your office that you were all rooting for the Leafs to make the playoffs, they showed a ton of heart during the stretch drive, and you're sure they'll be even better next year. DO NOT: Feel the need to wait for them to leave the room before the rest of you break out the party hats, confetti, and giant "1967" banner. DO: Stake out your "lucky spot" on the couch before the first game, making sure that you have a good view of the big screen TV, easy access to your beers in the fridge and all your post-game celebratory music loaded onto the stereo. DO NOT: Be overly rude when telling the manager of the electronics store that his security guards are blocking your view. DO: Listen politely as jealous Capital haters tell you that the team never won anything before Alexander Ovechkin came along. DO NOT: Condescendingly inform them that it would have been hard to win anything when Washington didn't even have a team before 2005, you're pretty sure. DO: Assure your spouse that yes, even though the playoffs are even more important than the regular season, you will still make time for your family just like you always do. DO NOT: Follow up by asking where that tiny one in the diapers came from. DO: Agree with your Canadien fan friend that there's no reason to think Carey Price can't lead the team on a long playoff run. DO NOT: Add "Well, other than his entire playoff career up until now" if you have anything important in your car that's flammable. DO: Consider placing a friendly wager on a game that you're not otherwise interested in since your team isn't playing. DO NOT: Consider placing a friendly wager on a game that you're not otherwise interested in since you're the backup goalie. DO: Politely explain to your non-hockey fan friend that while you appreciate him inviting you over to watch the game, it's generally considered quite rude for anyone to walk near the television while play is underway. DO NOT: Hesitate to add that, fine, you'll buy him a new cat if he's going to make such a big deal about this. DO: Remember to periodically spout that old playoff cliché that "In any series, the toughest game to win is the last one". DO NOT: Immediately turn to your friend who cheers for the Bruins and add "That would be the fourth one, by the way, just in case you guys forgot again." DO: Listen respectfully to your Canuck fan friends when they tell you that the team is absolutely stacked this year, is built for a long playoff run, and should have an easy time making it out of the Western Conference. against Khabibulin as an empty-net goal. We're into the final week of the NHL's marathon regular season. After six long months and over 1,000 games, the finish line is finally within sight and the playoffs are just days away. Many teams are still fighting tooth and nail for the few remaining postseason spots. Others are struggling to improve their playoff seeding. A fortunate few are already locked into a spot at the top of the standings, and are focused on staying healthy over the season's final days in anticipation of long playoff runs. And then, there are the sad sack teams with nothing to play for. The also-rans. The basement dwellers. This year brought us five teams that never managed so much as a meaningful late-season game. For fans of those teams, their only intrigue to the season came from calculating their odds for the draft lottery. Those teams are all but forgotten now, but that's not fair. So before we move on to our post-season previews and playoff pools, let's take one last look back at the five teams who brought so much joy to the rest of the league by spending their season getting stomped every night. Where it all went wrong: The team's talented rookie forwards were clearly overconfident, partly due to youth and inexperience but mostly due to shooting on Nikolai Khabibulin in practice every day. Reason for optimism: Have plenty of cap room to sign free agents, which is great since that always works out really well for them. Future outlook: Their embarrassing streak of being the sixth best team in all of Canada will almost certainly come to an end next year, once the Coyotes move to Winnipeg. Where it all went wrong: The season got off to a rough start when the team revealed their plan to ice a roster consisting entirely of New York Islanders. Reason for optimism: Team doctors are optimistic that injured star goaltender Rick DiPietro can recover in time to get hurt in next year's season opener. Future outlook: The team is on the right track and the future is bright, you think, if you want to keep your press pass. Where it all went wrong: While it was only natural to look for a scapegoat after last year's disappointing playoff loss to the Sharks, it was probably a bad idea to fire the guy in charge of reminding the players not to get injured all the time. Reason for optimism: Even through the tough times, the team's young players have stuck together. For example, just the other night they all told Paul Stastny to go out there and break a leg, and… hey wait guys, he does know that's a figure of speech, right? Future outlook: Will need to regroup quickly if they want to be ready for Peter Forsberg's next comeback. Where it all went wrong: It hasn't; the 20-year rebuilding plan is proceeding exactly according to schedule. Reason for optimism: Should finish around .500 next year, assuming the NHL adopts their "get one point for a regulation loss, too" proposal. Future outlook: Their offseason will begin in just five more days, according to that giant calendar hanging in Tomas Vokoun's locker right above his packed suitcase. Where it all went wrong: In hindsight, Cory Clouston's plea to the players to treat every game like a playoff game was a bad idea. Reason for optimism: Newly acquired Craig Anderson has established himself as the best goaltender in recent franchise history, since he seems to remember which direction to face without his defencemen constantly reminding him. Future outlook: Most experts agree with owner Eugene Melnyk's recent prediction that the team can return to contention quickly, in that sense that in an infinite universe seven or eight years isn't really all that long. Bloge Salming and I made this for you. May god have mercy on our souls. You can also view this video at TheScore.com's Houses Of The Hockey blog. 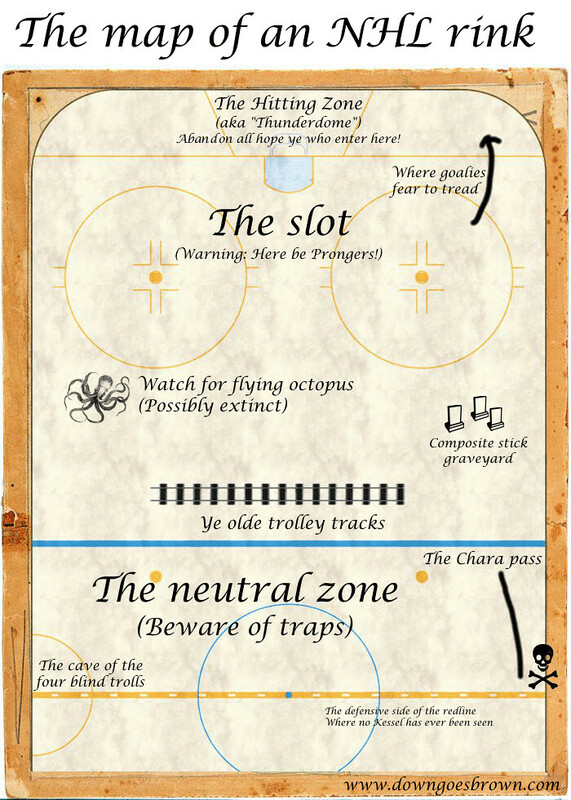 Visit blogesalming.com for more hockey fun. A convincing argument against seamless glass. Today is April Fool's Day, which is best known around North America as the traditional day for dull conglomerates to post painfully bad attempts at humour on their corporate web sites. But some of us may still remember the day's original meaning: an opportunity to play practical jokes on friends and coworkers. What does this have to do with hockey? Well, there are two things we all can all agree on when it comes to NHL players: They love playing practical jokes on each other, and they all read my columns first thing in the morning before heading to the rink. And given those two facts, I feel like I should take the opportunity to help everyone have some fun. So in the spirit of some good-natured tomfoolery, here are a few ideas that various players and personalities around the league should feel free to use on this special day. Let the hijinks ensue. Sidney Crosby - After finally being cleared to resume practising, lightly bump into a teammate during a scrimmage and immediately fall to the ice clutching your head. Months later, reveal to that teammate that you were only joking while chatting with him at the drive-through window where he now works. Mike Fisher - Walk up to a member of the Nashville media and introduce self by saying "Hi, I'm Mike Fisher from the Predators" before immediately adding "no, just kidding, I'm Carrie Underwood's husband". Edmonton Oilers - Send the entire scouting staff to sit in front row and watch top prospect Sean Couturier at tonight's game while scribbling furiously in little notebooks and flashing each other the thumbs up. Watch how depressed he gets when he sees them. Hey look, I think he started crying! NBC Sports - Tell your viewers that the New York Rangers are currently tied for seventh place, as if the NHL has more than five different teams. Jonathan Toews - Show off your sense of humour by spending a minute blinking exactly once every 12 seconds, rather than once every 15 seconds like normal. Tomas Kaberle - Good-naturedly inform your new Bruins teammates that hey, nice try guys, but you're not going to fall for that "We still have to play more games even after the regular season" ends joke. Ilya Kovalchuk - Call Lou Lamoriello, tell him that you think it's about time to start talking extension. Matthew Hulsizer - Hilariously tell your old pal Gary Bettman that you'd totally be willing to buy the Coyotes and keep them in Phoenix, and - hey, why is Bettman signing the paperwork? Guys, I was obviously joking. Hey, this isn't funny anymore! NHL Central Scouting - Release an updated list of the top 300 prospects for the upcoming draft; slip Phil Kessel's name in at #301. Paul Bissonnette - Spend all day arguing with your twitter followers that the infinite regress problem can be adequately resolved by a reliance on foundational beliefs that give justificatory support to more complex beliefs, before eventually revealing that you were actually a devoted advocate of Pyrrhonian skepticism all along. Corey Perry - Sneak in and steal Teemu Selanne's towel while he's soaking in that mysterious, glowing fountain that he bathes in every day for some reason. Henrik and Daniel Sedin - Just to see what would happen, briefly pass the puck to that strange person who seems to think he plays on our line even though he doesn't look anything like us. Pittsburgh Penguins - Play a hilarious joke on a rookie during a road trip by refusing to place his luggage on the team bus next to the other luggage; instead place it under the team bus, next to Matt Cooke. Toronto Maple Leafs - Pretend to be playoff contenders during a late-season surge before revealing on April 1 that it was all an elaborate joke played at the expense of your fans. So, same as every other year.